There is nothing more tasty on a midweek lunch than a bowl of piping hot chili sweet potato and butternut squash soup. Even more delicious is when it is homemade with a little warm kick of chili and is served with warm homemade bread. We love homemade soup and eat it quite often. It’s the sort of meal where you just grab any vegetables you have to hand and can be very economical to make too. This recipe is so easy and you will soon have a nutritious family meal. I also find homemade soups are a great way of getting vegetables in to the children. For a real comfort food meal I like to make this soup for a starter and serve with my homemade steak and kidney pie for mains followed by apple pie. 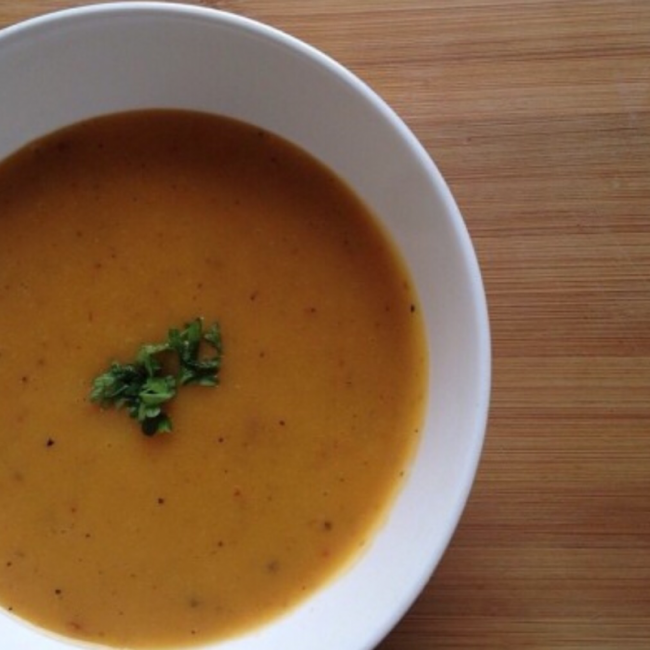 Are you a fan of homemade soups? I have never made a homemade soup. I may give this a go. I’m too guilty of just having a Heinz one! Ooh looks delicious and thanks for the extra tips such as freezing and serving suggestion! Mmmm, yummy! 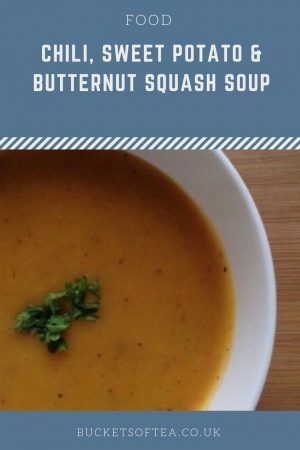 Love sweet potato and butternut squash soups. A big fan of soups here, they’re a great way of using up leftovers and a sneaky way to increase veg intake. This looks delicious, I love making soups – my favourite is parsnip soup, it’s also so comforting! This sounds delicious! I love homemade soups, this is one I will def be giving a go!! This soup recipe sounds right up my street. I might have to try it. I had something like this recently with chorizo added- amazing. This sounds so good for those cold winter days! I’m bookmarking this post so I can find the recipe later. Thanks for sharing with all of us! I like the little kick of chili here. Any thoughts on serving this chilled? Sounds delicious I’ll definitely give this a try!! Would this work without the chilli?